Victoria, Mahe (Seychelles) – May 21, 2018 (travelindex.com) – This coming week, Mauritius is hosting the “International Conference on Digitalisation and Sustainable Tourism”, which will be held on the 23rd & 24th May at Hilton Mauritius Resort & Spa. I have been invited by Minister Anil Gayan and will be part of many tourism professionals travelling to Mauritius for this event. Mauritius needs to be congratulated for staging this International conference which will put the spot light on the island and on the Vanilla Islands Region as a whole. Visibility is always important because it ensures relevance for any destination dependent on tourism. The official welcome of Air France JOON on Tuesday the 15th May at Seychelles International Airport was led by Minister Didier Dogley, Seychelles Minister for Tourism, Civil Aviation, Ports and Marine, which was followed the same evening by a cocktail at the French Ambassador’s Residence where three successive Tourism and Civil Aviation Ministers (Didier Dogley, Maurice Loustau-Lalanne & Alain St.Ange) were present showing the Seychellois appreciation of the resumed service by Air France. Jose da Silva Goncalves, Minister of Tourism & Transport of Cabo Verde made time during his official visit to Seychelles to meet with me to exchange ideas and discuss the years, when as Minister of Tourism, Civil Aviation, Ports & Marine of Seychelles, I worked closely with him at CAF, the UNWTO and at International Forums. The good relations between Cabo Verde and Seychelles have existed for many years as two small groups of mid-ocean islands saw the necessity to share ideas and to be supportive of one another. President Jorge Carlos De Almeida Fonseca of Cabo Verde has also visited Seychelles. 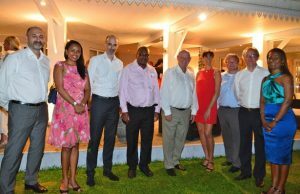 During discussions Minister Jose da Silva Goncalves also discussed opportunities for Seychellois Pilots for their growing Aviation network among other tourism related matters of mutual interest. AIG Travel reported last week on the results of a travel trend survey that revealed that 45 percent of female travellers feel less safe or much less safe about traveling than they did five years ago. This is a worry for world tourism because travel as an industry must be for all without any discrimination, and the responsibility or duty of care must be a prerequisite for all tourism destinations wanting to be featured in Tour Operator Programs. Results of the travel trends survey, commissioned by AIG Travel, a worldwide leader in travel insurance and assistance services, also show that safety is top of mind for women while they are evaluating potential destinations as well as during their travels. Seychelles and the Vanilla Islands have always emphasized safety and security as key Unique Selling Points (USPs) of the Indian Ocean Islands. Our region is still able to boast about its safety and security label, something which many other tourism destinations worldwide are unable to do. A “festival of flavours” from all over Asia made its way to AVANI Seychelles Barbarons Resort & Spa this month in their Tamarind Restaurant. The Resort welcomed Sri Lankan Guest Chef Lasantha de Silva to kick off the culinary tour before confirming that he will be followed by other Guest Chefs every month. To facilitate the local population wanting to appreciate the ‘Festival of Flavours”, Avani Seychelles Barbarons Resort & Spa have extended a special rate on rooms for those wanting to stay the evening. An important plus for Seychelles tourism is on display right across the world with Air France. Their Inflight Magazine for the month of May is dedicated to Seychelles. It is no coincidence that the month of May is also the same month when the Company’s JOON Brand introduced their flights to Seychelles. This Magazine, in addition to being available on all Air France flights, will also be on offer in all of the airlines’ lounges and travel agent shops. This is fantastic exposure for Seychelles! It has been confirmed by Reuters in New York that oil prices climbed above $80 a barrel last Thursday for the first time since November 2014. Global inventories of crude and fuel have dropped sharply in recent months owing to robust demand and OPEC-led production cuts. The Organization of the Petroleum Exporting Countries and non-OPEC global producers, that have curbed output since the start of 2017, will next meet to discuss supply policy in Vienna in June. Seychelles has been seeing its fuel prices at the pump increase to a record high and this is having an adverse impact on the island’s cost of living. Seychelles has no control over the new price of oil on the world market, but it has total control over the Government imposed duty of about Rupees eight per litre, which can be readjusted to mitigate further cost burden on the people of Seychelles. Last week on the International Day Against Homophobia, Biphobia and Transphobia, the British High Commission in Seychelles was flying the rainbow flag in support of inclusion, diversity and tolerance. The message being emphasized is that every person should be able to live a life free of discrimination and persecution. A post by H.E. C. Rohsler, the British High Commissioner in Seychelles said:- “Proud that today British High Commission flies the rainbow flag (representing LGBTI pride) today against discrimination against people who identify as lesbian, gay, bisexual, transgender or intersex”.